The aim of treatment for hip dysplasia is to keep the femoral head in good contact with the acetabulum. The specific course of treatment for each patient should be determined on an individualized basis with both the age of the patient and severity of their particular case taken into consideration. Early stage or mild adult hip dysplasia may be treated non-surgically while the patient continues to be observed for changes in the progression of their condition. Medication and steroid injections are used to relieve pain and inflammation in the hip. A cane can be used to temporarily decrease force on the hip joint while physical therapy strengthens the muscles around the hip and increases the joint’s strength and flexibility. In many cases of adult hip dysplasia, there is torn cartilage (labrum) that needs to be addressed prior to the undertaking of deepening the socket. In a minimally invasive procedure, a small camera is inserted into the body (arthroscopy) and used to view the hip socket which allows minor repairs to be made to the labrum. When used alone, the procedure will typically result in repeated tearing of the labrum. As a result, hip arthroscopies are most effective when used in combination with an osteotomy as outlined below. Periacetabular (Ganz) osteotomies are the most common and effective method for deepening and repositioning the hip socket beyond the age of skeletal maturity (age 15 in boys and 13 in girls). A periacetabular osteotomy is a surgical procedure where the hip socket is freed and reset. Screws are utilized to hold the socket in the correct position and proper alignment. The acetabulum is surgically separated from the rest of the pelvis and moved into the proper position over the femoral head. 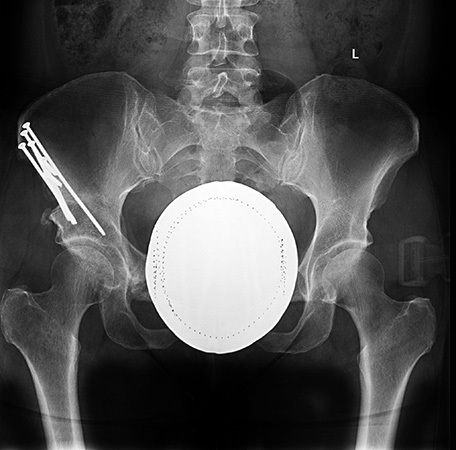 Over the last 18 years and hundreds of hips, we have had outstanding results in utilizing this procedure for teenagers and adults with acetabular hip dysplasia. Patient after right periacetabular Ganz osteotomy on the right side. There is marked improvement in the acetabular coverage of the femoral head. Less commonly, adult hip dysplasia requires the femur to be realigned into the cup. This is performed by cutting the bone, changing the rotation or angulation of the femur, and putting a plate and screws in place to hold the bone until it heals in position. Hip replacement should be a last resort reserved for cases of adult hip dysplasia where the severity of the condition renders all other hip preserving procedures insufficient.